I have had a load of demands for Outfit of the Day posts. I’m finally doing what I’m told! I should point out that what looks like a yacht is actually a dirty fishing boat is Howth :) I’m much more of a fishing boat type of girl anyways! Blazer ASOS (previous season) / Boots – New Look / Skirt – New Look / Ring – Boots / Bangle – River Island / Black Gold Bracelet – New Look / Bag – H&M / Glasses – H&M / Top – have no idea where this one came from! Note to self: Do not wear swingy skirts to a harbour when it’s windy :). Let me know if you like these kind of posts and I’ll keep them coming! I also just updated my Bump & Baby Blog – 26 weeks Pregnant! It’s a sunny Autumn day in Dublin – shocking, I know! The sun is beaming into my eyes! My dress is from Zara… I really need to find somewhere new to shop. My cardigan is from Penneys. My watch, bracelet and ring are from the accessories shop in the Biosfera, Peurto del Carmen, Lanzarote. Shoes are from Zara…I think! It has been a while since I last posted an outfit of the day. This is mainly due to the fact that I’m usually rushing somewhere and also because I rarely remembered to take my camera. Not any more. I have an iphone now so I have no excuse! Yes – No make-up! Aaaaaaagh!! I was heading out for breakfast and decided that barefaced with lipbalm was the way foreward… what was I thinking?! What are you wearing today? I love hearing what people are wearing. In fact some clever person asks that question regularly on my forum and I love reading the daily responses. I just took these with my little crappy camera so they quality it not fabulous but thought I’d give you a little look. Spring is in the air so I decided to let the legs out of prison for the day. I love this skirt and it was only €5. Yes, 5 friggin euro. Bargain! Thank you Penneys. The cardigan is from Awear, as is the white racer back top underneath. The butterfly necklace is from Penneys too. Could there be a more ‘Amy’ pair of shoes in existence? I think not! I found these pretties in New Look last Summer. I love loud shoes, I do get funny looks though. Such is life! And the face (whilst in PJ’s): Maybelline Dream Cream Foundation, MAC Satin Taupe on lid, Rimmel Intense under eye, MAC Angel lipstick with Perfectly Unordinary Dazzleglass, Eyeko Big Eyes Mascara, Benefit Hoola under cheekbones, Bourjois Blanc Diaphane as cheek highlight. Oops, forgot to do my eyebrows. I am crazy about ditzy floral print. I am so happy that it’s in style but to be honest I’d be wearing them regardless. I like throwing on a waistcoat to give more shape to my clothes. I am a UK size 8 but I am petite so I can look dumpy very easily. My biggest problem is trying not to get lost in clothes. I haven’t really figured this out yet. I think I’ll ask Anna. As you can see I am wearing practically no make-up, mousse shadow and mascara. These are my best buy this year (so far). They are made from the softest leather and they go with everything. Those of you who watch my haul videos will have seen this bag. This was a bit of a staple purchase. Although I’m a handbag junkie I didn’t own a very neutral one. I usually love unusual bags and this one is quite boring. For some weird reason I like it. I have layered a plain Abercrombie vest top under my shirt because it’s friggin freezing! I adore this bangle. I picked it up in a crafts fair in Spain. This ring is a little big but I find myself wearing it regardless. Jesus my hair looks illuminous! The sun was shining when the pictures were taken so it looks a little extreme. 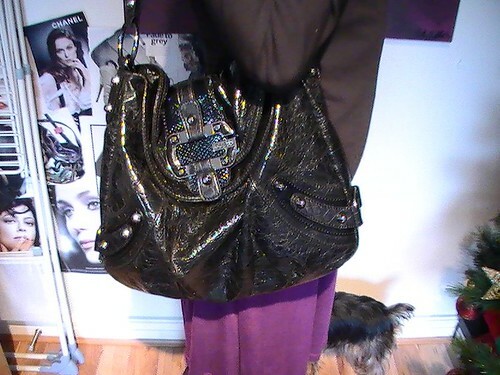 Love this bag so much. Wish I had have bought it in green too! I wear this braclet so often and it only cost €5. I love wearing it with a bold bag of another colour but similar strength. Wow the gruaig looks bright in the sunshine! My shoes are from Aldo. I bought this dress in Forver 21 whilst in Chicago. It was such a good bargain that I didn’t even bother to try it on. The fit isn’t amazing, it’s too wide on the shoulder, the seam on extends out. That’s what I get for not buying petite! I have quite a long waist to I’m not sure if this dress shape suits me.I wore it with some furry boots and a cardi because it is freeeeeezing!! (I wanted to wear some ballet pumps but that would be ridiculous in this weather). I bought the boots in Claires in Chicago (Aurora outlet) for $21. I wish I had bought another pair! I bought this is Next. I can’t remember the last time I was even in that shop before today. I wonder could a tailor cinch in the waist for me. Or maybe I should just throw a waist cinching belt around it. What’s your thoughts on maxi’s?